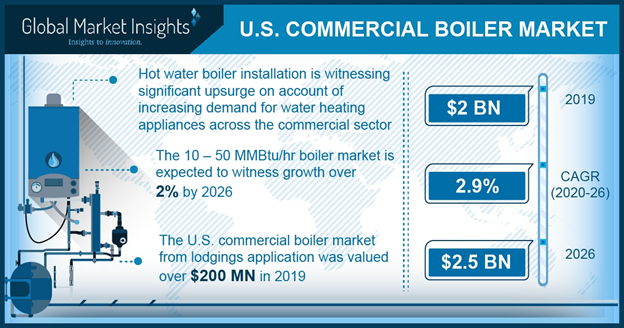 U.S. Commercial Boiler Market Trends « Global Market Insights, Inc. Shifting preference toward energy efficient boilers for carbon footprints abatement is providing a significant impetus to U.S. commercial boiler market outlook. Add to it, mandatory roll outs in the country for the reduction of the hazardous gas emissions is further encouraging the end use industries to rapidly deploy these energy efficient commercial boilers. EPA, for instance, has recently initiated NESHAP (National Emission Standards for Hazardous Air Pollutants) to govern carbon emissions across commercial and industrial sectors. In tandem with the regulatory framework, technological interference has also played a major role in influencing the overall U.S. commercial boiler market dynamics. Building automation systems, boiler to boiler communication, and remote diagnostics are some of the novel technologies that have immensely complemented the product landscape. Driven by such affluent advancement pipeline, the U.S. commercial boiler market stood at USD 3,000 million in 2017. The remarkable expansion of U.S. commercial boiler market can be majorly credited to the country’s growing investment in healthcare and educational sectors. In 2016, U.S. registered a healthcare expenditure of USD 3 trillion, which was almost 17% of the nation’s GDP. The widening scope of potential healthcare applications ranging from space and water heating in hospitals to equipment sterilization indeed has increased the U.S. commercial boiler market demand. According to the Centers for Medicare & Medicaid Services (CMS), approximate healthcare spending in the U.S. in 2016 was USD 10,000 per person – a data bearing testimony to the strong stance the healthcare application holds in the regional landscape. The region further being swayed by cold climate further provides a slew of opportunities to the commercial boiler industry players. For the record, North Dakota, Minnesota, South Dakota, Alaska have been touted as the coldest regions in the U.S. with recorded average winter temperature of up to 12°F. Elaborating further on the application landscape, the commercial infrastructure development, particularly the office sector is significantly driving the commercial boiler market demand in the U.S. As per estimates, the U.S. commercial boiler industry share from office applications was recorded at USD 700 million in 2017. With the go-green notion encompassing the infrastructure domain, this application is set to garner lucrative proceeds in the ensuing years. Ohio stands as a major beneficiary of the growing trend of energy efficient buildings. From 2014-2015, Ohio’s construction sector witnessed a surge of 6%. The overall Ohio commercial boiler industry share is forecast to exceed USD 150 million by 2024. In terms of the fuel prevalence across U.S. commercial boiler industry, natural gas-based boilers have garnered immense traction, primarily owing to their low emission rates and superior efficiency. As per reliable data, natural gas is touted as one of the chief fuels in the commercial sector with more than 3,177,099 million cubic feet recorded consumption in 2017. In terms of the profitability potential of these boilers, the gas fired U.S. commercial boiler industry is projected to surpass USD 3 billion by 2024. The demand for oil fired boilers is anticipated to be sluggish with a target CAGR of 2% over 2018-2024, on account of low efficiency and high emission rates. Regionally, Florida, Virginia, Texas, and Delaware are the four major significant geographies that display a strong contendership in the U.S. commercial boiler market. Florida had a notable contribution toward the overall industry share in 2017 and is anticipated to surpass an annual installation of 1500 units by 2024. Robust development in the medical and tourism sectors is chiefly stimulating the regional growth. Texas commercial boiler market is also projected to generate a substantial momentum in the overall landscape, having procured 50% of the West South Central commercial boiler industry share in 2017. All in all, the U.S. commercial boiler market has been undergoing a radical transformation over the recent years. With the resurgence of commercial sector and rising and unstoppable notion of go-green capturing the entire business fraternity, commercial boiler industry is set to emerge as one of the most affluent verticals of the energy cosmos. The fraternity is forecast to surpass a revenue of USD 3.5 billion by 2024. This entry was posted in ENERGY, MINING, OIL AND GAS and tagged U.S. Commercial Boiler Industry, U.S. Commercial Boiler Market, U.S. Commercial Boiler Market Analysis, U.S. Commercial Boiler Market Growth, U.S. Commercial Boiler Market Outlook, U.S. Commercial Boiler Market pdf, U.S. Commercial Boiler Market Price, U.S. Commercial Boiler Market Report, U.S. Commercial Boiler Market Share, U.S. Commercial Boiler Market Size, U.S. Commercial Boiler Market Trends.